Idea Cellular has expanded its prepaid offerings with the addition of a new Rs. 295 recharge option. The new recharge brings ‘unlimited’ voice calling, 5GB of 2G/ 3G/ 4G data and 100 SMS messages per day for 42 days. The calling benefits come under the voice commercial usage policy that limits 250 minutes per day along with a weekly ceiling of 1,000 minutes. The Rs. 295 Idea recharge is taking on the Rs. 299 recharge option by Airtel that brings unlimited voice calling and 100 SMS messages per day for 45 days but without any data benefits. Also, the Rs. 295 Idea recharge gives subscribers an alternative to the Rs. 251 Jio recharge that offers unlimited voice calling benefits alongside 2GB data per day for 51 days. The Rs. 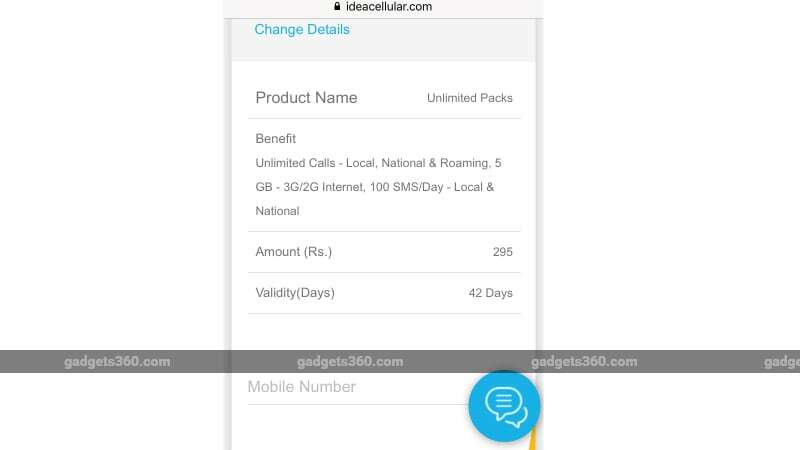 295 recharge option by Idea brings 5GB data and 100 SMS messages per day benefits with a validity of 42 days. Unlike some competing unlimited voice calling packs, the latest recharge option brings a ceiling of 250 minutes local, STD, and roaming minutes per day and 1,000 minutes per week. This means subscribers making more than 250 minutes of voice calling in a day will need to pay 1 paisa per second for the rest of the day until midnight. Similarly, the subscribers consuming the 1,000 minutes limit will be charged at 1 paisa per second for the rest of the week. Additionally, the voice calling benefits under the Rs. 295 Idea recharge are valid for 100 unique numbers. This means if you make calls on more than 100 unique numbers, Idea will charge you Rs. 1 paisa per second. Similarly, subscribers exceeding the 5GB data limit will need to pay 4 paise per 10KB. The Rs. 295 Idea recharge is valid across all the 4G circles of the telecom operator. Idea subscribers can get the new option directly through the My Idea app or by visiting Idea website. As we mentioned, the Rs. 295 Idea recharge competes against the Rs. 299 Airtel recharge and Rs. 251 Jio recharge. The Airtel option includes unlimited voice calling and 100 SMS messages per day benefits for 45 days, but it doesn’t come with any data benefits. In contrast, Reliance Jio offers unlimited voice calls and 2GB data per day for 51 days through its Rs. 251 recharge but doesn’t provide any SMS messages. Telecom Talk first reported about the Rs. 295 Idea recharge.